What Is a Storm Moon? As the saying goes, March rolls in like a lion, and if we're really lucky, it might go out like a lamb. It's the time of the Storm Moon, the month when Spring finally arrives, around the time of the Equinox, and we see new life begin to spring forth. As the Wheel of the Year turns once more, heavy rains and gray skies abound — the earth is being showered with the life-giving water it needs to have a fertile and healthy growing season. This is also a time of equal parts light and darkness, and so a time of balance. Depending on where you live, this moon may be called the Seed Moon, Lenten Moon, or Chaste Moon. Anglo-Saxons called it Hraed-monat (rugged month), or Hlyd-monat (stormy month). A stormy March was an omen of poor crops, while a dry March indicated a rich harvest. According to the Farmer's Almanac, this month's moon is sometimes called the Full Sap Moon and the Worm Moon — and no wonder, since after a storm, there are worms all over the place! As the temperature begins to warm and the ground begins to thaw, earthworm casts appear, heralding the return of the robins. The more northern tribes knew this Moon as the Full Crow Moon, when the cawing of crows signaled the end of winter; or the Full Crust Moon, because the snow cover becomes crusted from thawing by day and freezing at night. 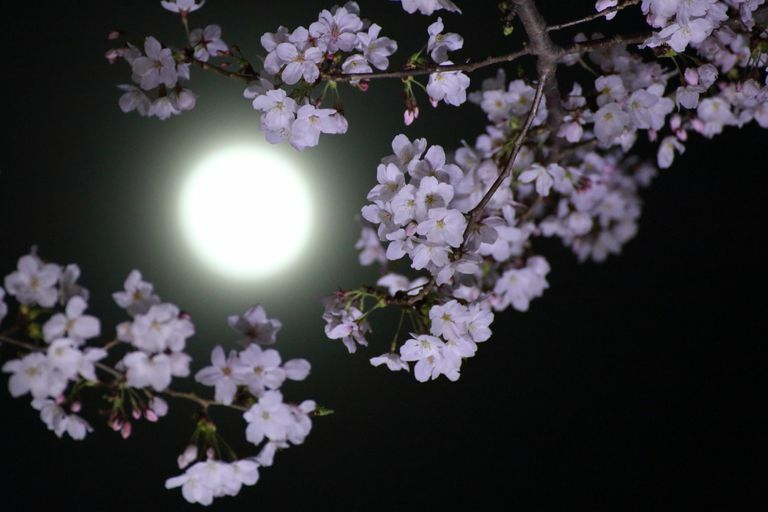 The Full Sap Moon, marking the time of tapping maple trees, is another variation. As the weather can be anything but predictable, the month of March in your area might not see the same weather as other locations, because your environment depends on a number of factors. If you need to adapt March's magical correspondences to those of a different month, then feel free to do so. Colors: Use green, yellow, and light purple to represent the colors of the season. This is a great time to explore magic with pastel colors. Gemstones: Bloodstone and aquamarine are often associated with early spring, the vernal equinox, and the month of March. Trees: Dogwood, honeysuckle, lilacs, and cherry blossoms are just beginning to bloom this time of year in many areas, so find a way to incorporate them into your workings as needed. Gods: Work with Isis, the Morrighan, Artemis, and Cybele, all of whom are considered powerful during this time of year. Herbs: High John, pennyroyal, wood betony, and apple blossom can often be found during this season, depending on where you live. Element: Water is the element most closely associated with the Storm Moon — after all, it's one of the wettest time of the year, thanks to thunderstorms rolling through. Use this month for magical workings related to rebirth and regrowth. New life is blooming during this phase of the moon, as is prosperity and fertility. Here are some things you can do this month and plan accordingly. Begin planning your magical herb garden for the year. What would you like to grow? Consider whether you want specifically medicinal and healing herbs, or if you're going for a variety of magical purposes. Are you thinking about making a change in your career? Now is the time to tidy up that resume and get it up to date. Start researching the companies you'd really like to work for and figure out what you need to do to make it happen. Make phone calls, network, send in applications, and take control of the reinvention of your career. Got a storm rolling in? Place a jar or bucket outside so you can gather rain water for use in ritual (bonus magical points to you if it's collected during a lightning storm!). Spring tends to be the time of year to begin thinking about going back to school in the fall — partly because for many colleges and universities, this is the season when acceptances are finalized. If you're thinking about continuing your education, get those admissions forms completed. If you've ever thought about changing your life (haven't we all? ), especially by making big changes, now is the time to plant the seeds for those efforts. Place your magical tools outside for cleansing during the Storm Moon. If you don't have a copy of the Farmer's Almanac, it really is worthwhile to invest in one -- they're less than $10. You can also visit their site online and see what the weather and agricultural markers are for your zip code on any given date.